SCVHistory.com | Soledad Canyon | Thomas F. Mitchell, Soledad Canyon Pioneer and - Killer? Thomas F. Mitchell, Soledad Canyon Pioneer and – Killer? Could Col. Thomas Finley Mitchell, the prominent Soledad Canyon pioneer, have been involved in a homicide? A review of newspaper articles from 1883 offers suggestive, albeit inconclusive, evidence that this might have been the case. 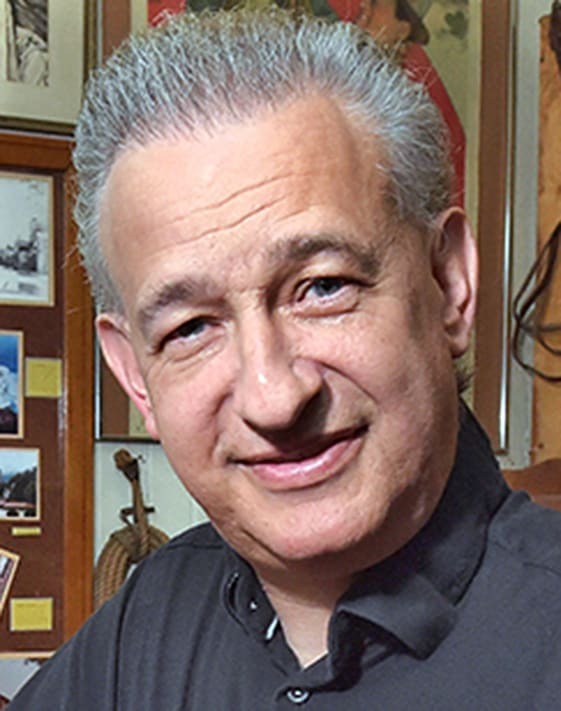 Blood feuds ran deep in the early days of the Santa Clarita Valley, and the otherwise model citizen, Col. Mitchell, might not have been immune to the Wild West violence that was quite common in those days. A native of Virginia born in 1827, Mitchell had served in the Mexican War with the Texas Mounted Volunteers under the command of renowned Gen. Sam Houston. He was lured to California by the gold rush in 1852 and spent the next eight years seeking his fortune, alongside the multitudes of other argonauts from around the world who had descended on the Golden State by wagon train and seafaring vessels. In 1860, Mitchell finally gave up his quest for gold, moved to Southern California and became the first American settler in Soledad Canyon. He traveled to Tehachapi and purchased a miner's cabin, which he hauled down to Soledad to serve as his first home. There he established a cattle ranch at the modern-day junction of Soledad Canyon and Lost Canyon roads. He also dabbled in bee hiving. A few years later, Mitchell met 17-year-old Martha Taylor of Arkansas. They married in San Gabriel in 1865. The newlyweds moved to his ranch in Soledad, where "the coronel" (probably an honorific rather than an actual military title) abandoned the miner's cabin and built a larger adobe home. The Mitchell home would soon be graced with six children. 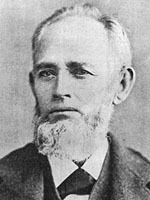 Mitchell and his neighbor John Lang got together in 1872 to establish the Sulphur Springs School District, the first in the Santa Clarita Valley and second oldest in Los Angeles County history. The Mitchells offered their adobe as the schoolhouse, where Martha Mitchell taught the children of her family, as well as those of the Langs and six other local families. Walter Murphy (left), son-in-law of Thomas F. Mitchell, with A.B. 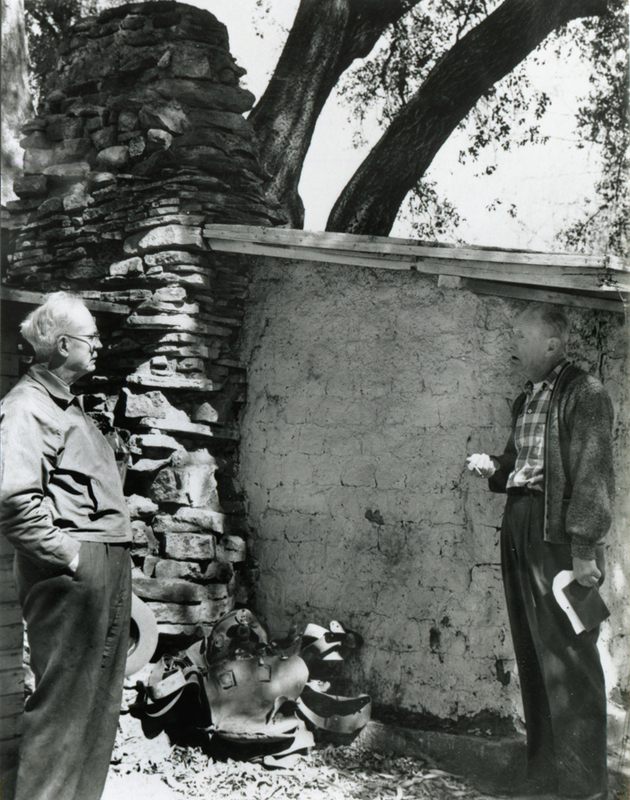 Perkins at the Mitchell adobe in the early 1960s. It was the first structure known to have been used as a school in the SCV. Click image to enlarge. The school was moved to Lang's hotel in 1879. In 1886, as enrollment outgrew the Mitchell and Lang buildings, Mitchell donated a site for Lang and Sanford Lyon to build the first Sulphur Springs School. The Mitchells moved from their adobe and built a two-story ranch house two years later. The adobe would fall into disrepair in subsequent years. Nearly a century later, in 1986, what remained of the adobe was saved from demolition by members of the Santa Clarita Valley Historical Society and brought to Heritage Junction in Newhall, where it was rebuilt and remains today. But there could be a darker side to the Mitchell story. Los Angeles newspapers of June 5, 1883, told of a murder near Newhall. The Los Angeles Times reported that Thomas F. Mitchell of Mitchell's Station, situated 12 miles north of Newhall, had sent a note to Newhall Postmaster George Campton stating, "I have shot and killed F.O. Moore [sic]. Send out Coroner to take charge of the body." The Coroner took an evening train to Newhall, where he secured a wagon and with a posse headed out to Mitchell's Station. There he found the body of Moore with a crowbar in his hand, about 35 feet from Mitchell's house, riddled with buckshot to the head and stomach. The already decomposing body was brought back to Newhall where a coroner's jury was hastily convened. The jury later concluded, "We the jury find that Thomas O. Moore came to his death from shotgun wounds at the hands of Thomas F. Mitchell." There were no witnesses to the murder, and Mitchell refused to testify on the advice of his lawyers, who had come up from Los Angeles. Moore was described as a 39-year-old native of New York with a quick temper and revengeful spirit. Mitchell was thought to be a 55-year-old native of Tennessee with a reputation as a quiet and peaceable man. Apparently the two men had a longstanding feud, stemming from a quarrel over some trespassing livestock and a piece of land which both claimed as his own. Moore had purportedly abused Mitchell on repeated occasions, once even slapping his face. "But it is a notorious fact that family quarrels and neighbors' feuds are of the most bitter character and frequently end in bloodshed," The Times concluded. "Moore was buried yesterday, and Mitchell was walking around when our informant left, expressing a wish to have his examination there immediately without going to Los Angeles. He evidently expects a discharge." The next day, the Times reported: "The killing of T.O. Moore by T.F. Mitchell is the all absorbing topic. The parties were well known and lived near each other, about 13 miles from [Newhall]. There has been an old feud existing between them for years, which was aggravated by a recent land dispute. The deceased was continually making threats against Mitchell, and the latter was on his guard." 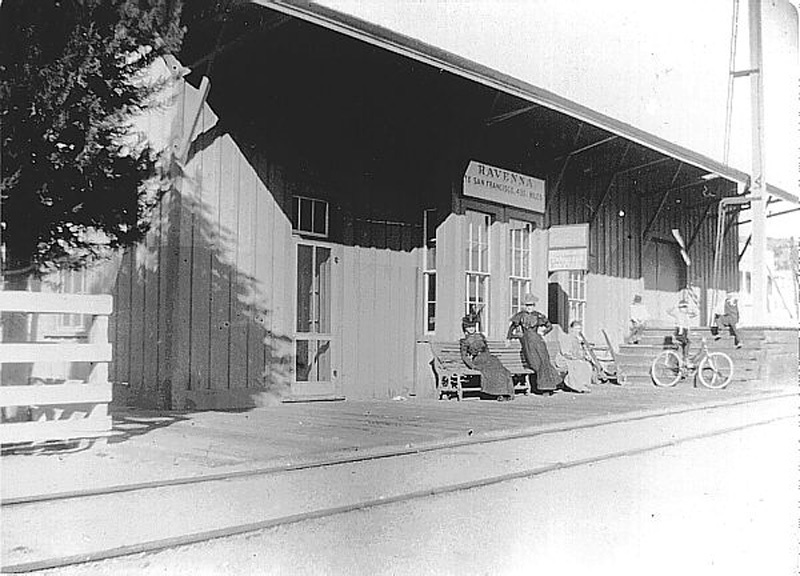 The 1880s Herald reporter in downtown Los Angeles used Ravenna as a locator; at the time, the Ravenna depot, seen here, may have been a more prominent shipping point than Lang Station, which was closer to the Mitchell spread. Click image for more information. Newspapers of the period did not always get their facts straight, and the story is somewhat muddled by an article on the murder which appeared in the June 5, 1883, edition of the Los Angeles Herald. It stated that the murder took place near Ravena [sic - Ravenna], a Southern Pacific railroad stop several miles up Soledad Canyon from the Mitchell home. The Herald reported the killer's name as "P.M. Mitchell," a neighbor of Moore. The Herald said there were two witnesses to the murder, and at the coroner's inquest, "Mitchell admitted the shooting and said he feared bodily harm, but just how he was to be harmed at a distance of seventy-five feet from a short piece of iron railway bar does not well appear." There is no evidence that Mitchell ever faced jail time for the murder of Moore. A listing of a court proceeding in the Los Angeles Herald of Nov. 13, 1883, said, "People vs. Thos. F. Mitchell – Defendant in Court with counsel John F. Godrey, Esq. and District Attorney. Jury called and present. Argument continued; jury instructed by the Court and retired to deliberate upon their verdict. The jury failed to agree and was discharged." Was this truly the Thomas F. Mitchell we know from Santa Clarita history? With the evidence as stated above, the reader will have to decide for himself. Perhaps further research is needed to pin this for sure on the colonel. Col. Thomas F. Mitchell died Dec. 24, 1907. He is buried with his family in the Mitchell Cemetery, which can be visited today next to the 14 Freeway, just past Lost Canyon Road.